A Traditional and Heartened Welcome of New Dots at Multidots! Who told that seniors and juniors have been in rivalry since long? Multidots have been actively involved in socializing events that helps to create an environment where everyone can work on the same floor. Thus, Multidots has organized a welcome party for new dots in traditional way, which was full of fun, teamwork and one of the most memorable events of the lifetime for everyone, specially the new dots!! At Multidots, we have been maintaining old, yet ever green tradition of acceding new dots (we call our employee a dot) by encouraging them for their first step in corporate world. 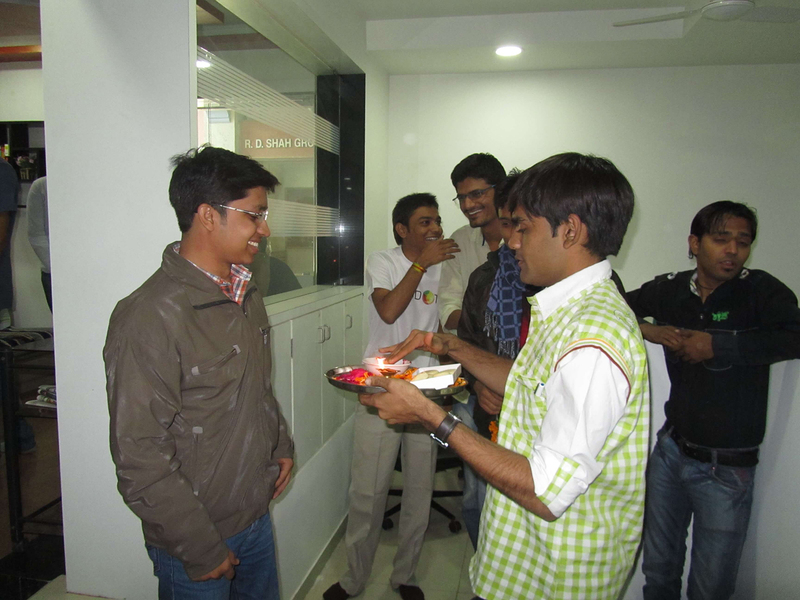 The enthusiastic team of new dots, Hiral, Tejas, Bharat, Jaydeep, Priyank, Ravi, Nimesh, Sandeep, Kamlesh, Ravindra, Neha was welcomed by “Red Tilak” for good luck followed by Aarti. The new dots were each given a small greeting card with a quote (message), which the seniors had prepared for them. This showed the mantra which they followed in their corporate lifestyle to reach at success peak in their respective careers. 19th January, 2013 was celebrated at Multidots, where the agenda clearly stood saying that, “Healthy Relationship between Seniors & Juniors can take a leap ahead for they’re as well as the organization’s future.” Few explorative activities were preceded after welcoming the new team. Though having peak time during their office hours, the seniors took special interest and invested their time in planning, organizing and making this welcome event a success. As the new dots and existing team members have been working together on few projects, we always strive hard to make each new member, a part of our healthy family. Ice-Breaking game was newbie to these fresher and they enjoyed playing it thoroughly, saying names of the “new dots” of the organization, at the very moment of curtain falling. Make-Me-Laugh competition can really make you laugh, cracking jokes, funny acts or be it anything which can make a person laugh till his/her stomach aches. Last but not the least, was thrilled game of chit-making. Few of Multidots team made amazing, comical yet pleasure-giving game called “Do & Act-As-Chit”. Small Chits were prepared, where in the chit-taker had to speak for at least a minute on the given topic. Sounds interesting, isn’t it? These were very much joy making moment for all the people, present over there. The seniors apart from having healthy time with new dots, also had something special to say after Snacks time. The best savory dishes of Gujarat were arranged for all them to complete the evening with a pinch of delicacy! This welcome event was celebrated congenially having cool atmosphere where Multidots family cheered and supported the new talent, where they can explore their creativity and hidden talents for bringing prosperity to both, them and the organization too. Sweet memories last longer, so these wonderful event moments were captured in camera, while making the atmosphere more appealing. At Multidots, we provide environment which would be ideal for a person to display his/her abilities and skills in best way, thus utilizing efforts in constructive way. With support and positive approach towards work, we coach new dots and celebrate success while equipping them in building and working towards realistic goals. A place where new talent is welcomed with new thought and mind-set, this event would be an add-on to the existing long list of celebrated events at Multidots. Hi new dots….. Wish you all the best to new team member of Multidots. Very Good Idea Guys.. All the best to New Dots..